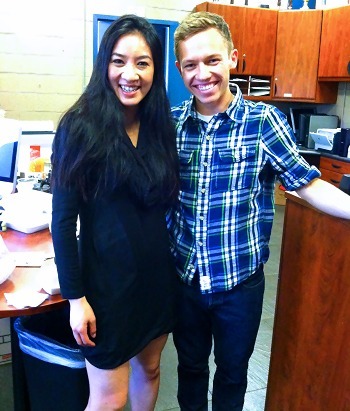 Grant Hochstein and Michelle Kwan share a moment at the East West Ice Palace in Artesia, CA. 2013 Skate Detroit was a victorious homecoming for USA’s Grant Hochstein who won the event and landed a quadruple toe-triple toe for the first time in competition. The 23-year-old earned an impressive 16.15 points for this element alone in his short program to Ennio Morricone’s La Califfa. Hochstein admitted to being a bit nervous; however, he was excited about performing the challenging jump in front of supportive family and friends. Hochstein trained in the Detroit area for thirteen years before deciding to relocate in the spring of 2012 to the East West Ice Palace in Artesia, California, to work with Peter Oppegard and Karen Kwan-Oppegard. At Skate Detroit, Hochstein debuted his new free skate to Trio Élégiaque, No. 2 by Rachmaninoff, Dumky Trio by Dvořák, and Piano Concerto No. 3 by Rachmaninoff. Hochstein is well-known for being an ardent admirer of Michelle Kwan and has spoken often about what an inspirational figure she is to him, both on and off the ice. Hochstein helps pay for his own skating by coaching, and has started to work with some of Peter Oppegard’s students. One day, Hochstein hopes to finish his college degree. When he’s not skating or coaching at the rink, Hochstein loves to read, take care of his dog (Kingston), go to the beach, hang out with friends, and imagine traveling back to places he loves, such as Rome and Paris. For now, however, Hochstein’s focus is squarely on the 2013-14 season. He has set big goals for his skating this year.